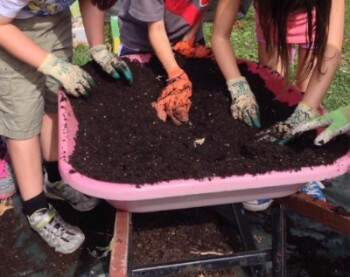 Founded in 2013 with generous support from Partners for Health, the DIGS program helps all eleven public schools create, maintain, and enhance their own gardens. The program provides a living classroom for multi-disciplinary learning and opportunities for social action. Through partnerships with local food pantries and other nonprofits, student gardeners supply fresh, healthy food to Montclair's disadvantaged citizens. Built in memory of David Greenwald, a Montclair Public School student who tragically lost his life in 1998, the challenge course helped thousands of Montclair students and residents learn teambuilding and problem-solving skills. Hurricane Sandy damaged the original course, and the Greenwald family generously replaced it with a fitness patio that provides an outdoor gym to MHS students and Montclair residents visiting Rand park. Major funding provided by family and friends of David Greenwald. As the lone public high school in our district, Montclair High represents our crown jewel. It offers an exciting education to our diverse group of 2,000 students. In partnership with the Montclair Public Schools and several individual and nonprofit partners, MFEE has prioritized funding that ensures MHS's ability to provide an exemplary 21st education to all of its students. Below are a list of projects MFEE has funded recently to improve the lives and future of our students. MFEE upgraded the cafeteria to include a student lounge/meeting space, complete with charging stations, redesigned layout, and comfortable furniture to facilitate study groups and club/community meetings. MFEE supporters, particularly attendees of the 2015 Joe Walsh Comes Home Fundraiser, contributed over $200,000 to redesign the school library into a state-of-the-art media center. The new space is modeled on college study centers and provides small-group instructional rooms, furniture that facilitates group study, individual study carrels, and significant technology upgrades. MFEE complemented the school district's investments in MHS classroom projectors by providing robust projection and audio systems in two of its primary meeting spaces: the LGI Auditorium and the Cafeteria. This equipment enhances both student learning and staff collaboration. Summer enrichment experiences are vital to student achievement. To ensure that our most vulnerable students benefit from quality summer academic experiences, MFEE awards scholarships to students who might not otherwise be able to attend the district-led summer camps. Sports teach valuable lessons, and they can engage the uninspired student. MFEE's True Blue Initiative is dedicated to enriching the athletic experience for all Montclair High students. Major accomplishments include: partnering with the Furlong family to renovate the Furlong Field House in 2008, launching the school's first crew team, providing innovative equipment for physical education courses, developing a professional development lecture series for coaches, and empowering student athletes through the MHS Athletic Council.